Loma Larga Vineyards is a family owned operation that has deep roots in the history of Chilean winemaking. The interest in wine in the Diaz family dates back to the 19th century where their grandfather personally brought French grape varietals home to Chile from his excursions in both Paris and Bordeaux. The family decided to continue in this rich history by replanting vines at their estate in Casablanca in 1999. 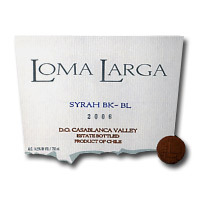 The 2006 Loma Larga Syrah is composed of 100% Syrah and was aged in French oak barrels for 14 months. This darkly colored red wine is brimming with beautiful and rustic aromas of black currant, cassis, dried herbs, mineral, soil, scorched earth, and dark chocolate truffle. It's a complex bouquet that expresses quite a wide range of both fruit and terrior. The dried herb and peppery notes are both characteristics of the region and the varietal. On the palate this wine has some serious black fruit character, that combines with savory dark chocolate and a touch of rosemary. The fruit is ripe and rich, and the tannins are bold, gripping, but surprisingly sweet. The finish is very long and slightly chunky.